Sunday (12/10/2013) was forecast to be sunny so I decided to try visiting somewhere new, Cotswold Water Park, it looked good, lakes, woods, wildlife and also dog friendly (during the summer dogs freedom is more restricted). The park is huge with lots of lakes so we decided to visit the ‘park and beach‘ area, mainly because Mum misses her beach at Hastings. I had a rough glance at the map, them emailed Mum the postcode to enter into the satnav come morning, of course she didn’t check her email before leaving so we ended up following my memory, A417 towards Cirencester. Luckily it was easy enough, once we got close to Cirencester signs popped up, then after finding the park itself the beach was signposted too, basically heading straight on with few turns. After a roughly forty minute drive we were parked, this was the longest journey the dogs had done (it was also the first time I’d left the county in years), we were expecting some travel sickness but they were great (a big relief as I was in the back with them), they did whine a fair bit but as they aren’t used to travelling it wasn’t unexpected. After enquiring on the rules for dogs and getting our exit token we headed for the beach, it’s not exactly big, but it has sand and water and was pretty empty being winter, I wouldn’t want to try going on it in summer with lots of people, there’s no way I would be able to fit. I managed to get the chair on and off the sand, but the access isn’t great, slopes are steep and there’s a fairly big step down where I got on, my chair has big tires, narrow tires would likely sink and be a nightmare, be warned. The first thing I heard once on the beach was a splash, my dog Kara-El, who has never been swimming in her life, had spotted a buoy and, as she is obsessed with balls, jumped in and swum towards the big bally! She suddenly realised she was swimming and headed back to shore but it was lovely to see, all the dogs enjoyed running round the beach and getting their feet wet, the Frontier X5 handled the sand and uneven beach admirably, I even dipped the wheels in the lake. We spent over half an hour on the beach, it was surprisingly warm for a November day, the water looked rather cold though, which my Aunt found out when she threw the dogs ball too far and paddled in after it, she’s seventy this year so I was rather impressed to say the least. After the beach we followed the path around the North lake, we let Mia, Kara and Dexter off lead, but attached to each other and Tia off on her own, the chihuahuas we kept on leads as they don’t like being caught and we really didn’t want to lose them. I lead the way as usual and decided to take a path which branched off, it was a lovely route passing a quarry and little lakes, you could hear and see birds flying everywhere. I love nature so feeling like I was in the middle of nowhere was very enjoyable, Tia accompanied me most of the time, wandering ahead but making sure I was in sight, the other dogs would alternate between us all, checking everyone was safe. The path was quite bumpy in places with deep muddy puddles, but it is winter I suppose, I actually quite enjoyed the puddles and pushing the chair and myself a bit. The path went on quite a way and I hoped it would rejoin the other path but had a feeling it wasn’t quite the right direction, after crossing a little bridge and going past a hide it looked like the path had a rather large puddle ahead, I reported this too the unimpressed faces of my Mother and Aunt, they were insistent they wanted to check as it was well over a mile to turn back. I decided it really wasn’t fair them getting wet so volunteered to check myself, I actually quite liked the idea but shhh, the only concern I had was getting water in the motors and having to be rescued, so off I went after detaching Peppa from the chair. The water wasn’t too deep at first and really just a large puddle, with Tia by my side I went further, the mud floor turned into little pebbles which obviously meant this was a stream, it was very pretty though, clear water rippling and glistening above multi-coloured stones. It then started to get a bit deeper and darker, reeds and grass on either side and surrounded by midges (at this point I was extremely grateful for my ventilator, being able to breathe without inhaling or swallowing midges was rather handy), I had really come far enough, I knew it was going to turn into a lake and although I don’t mind taking risks sometimes I’m not stupid. After being asked if I was certain there was no way through we turned round and headed back. The outing ended sitting outside the wooden cafe drinking coffee gazing out at the birds on the lake, I must admit this was probably the most enjoyable day out I’ve had in years. The journey home wasn’t exactly uneventful either, Mum decided to use the satnav, I couldn’t see well from the back anyway with steamed up windows so didn’t object, I probably should have in retrospect. After finally calculating a route the satnav decided to take us in a direction which didn’t quite seem right to me, lots of right turns (isn’t that a circle? ), then we entered Swindon, yeah I was pretty certain this was wrong, Mum persisted until the satnav directed us down a private road then tried taking us down another which was ‘works access only’, after that my Aunt and myself took over navigation. The trip home took well over an hour and everyone was pretty exhausted, on the plus side the dogs weren’t ill and I know my ventilator can last on battery at least 7 hours, that means we can travel further in future. 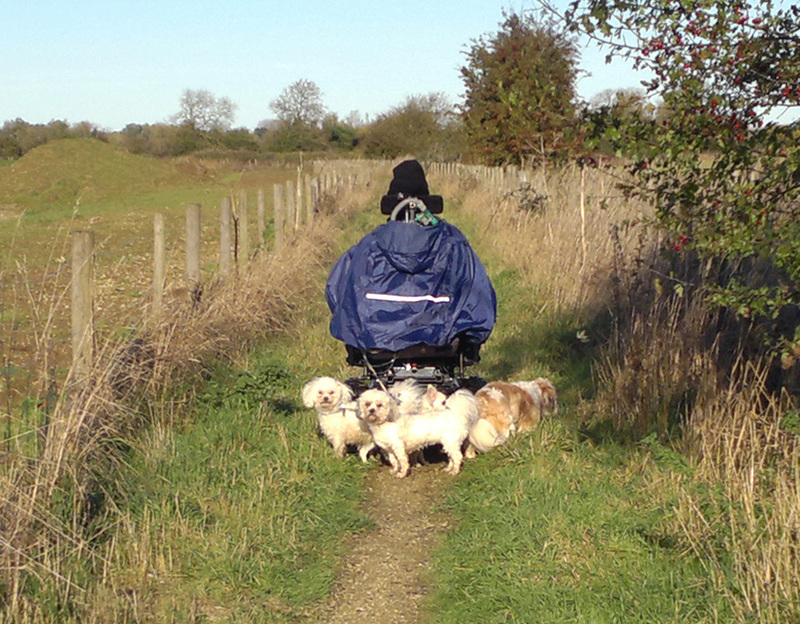 This entry was posted in Outdoors and tagged beach, birds, Cotswold Water Park, Daniel Baker, Dexter, dogs, Frontier X5, kara, lakes, Lottie, Mya, outdoors, Peppa, South Cerney, Tia, watersports, wheelchair. Bookmark the permalink.